Last week, Streetsblog introduced a six-part series by Mark Vallianatos looking at how city leadership can start truly integrating land use and transportation in the six geographic zones he outlined: parks, hills, homes, boulevards, center and industry. First, he outlined the series and wrote about parks. Later, “The Hills”and “Homes Zone” got it’s turn. Each section includes a “ preferred mobility” that the land use and transportation networks should support, a description of the land type and Vallianatos’ prescriptions. The Boulevards Zone is where Los Angeles moves, meets, mixes. I named it after Christopher Hawthorne’s series on six of LA’s iconic boulevards . Los Angeles’ boulevards have intriguing histories, many well-known landmarks, and a strong role in shaping present-day LA. But they are usually not great places to walk or bike along or to spend time on, and have yet to fully adapt to a more diverse and dense city. If you had been driving down Wilshire during the 1963/4 winter holidays, you might have seen a young man with a bowl cut and glasses cycling the length of the boulevard. This was British artist David Hockney. It was his second day in the Los Angeles region, the start of a long intermittent residence where he made radiant paintings of pools, palm trees, showers, friends and lovers. In his autobiography, Hockney (who didn’t know how to drive a car) describes buying a bicycle immediately after arriving in California so he could go visit Pershing Square, which he had read about in John Rechy’s novel City of Night. Wilshire Boulevard stayed a bad place for bikes for fifty years. But it’s become one of the busiest bus corridors in the nation. Extension of the purple line subway was approved after decades of delay. The first stretch of bus-only lanes also usable by cyclists just opened. For Los Angeles’ specific needs, I’d also prioritize affordability of tickets and passes , as well as ensuring that all stops have seats and shade for the comfort and safety of riders. Curitaba zones for BRT by requiring that the bottom floors of building on its bus corridors be retail and then allowing additional floors if housing is provided above the commercial space. A model closer to home in Los Angeles is the new Cornfields Arroyo Seco Specific Plan (CASP), which allows a mix of residences, commerce and light industrial uses in the same neighborhood and inside the same buildings. Zone for sufficient density with bonuses for affordable housing. Expanding transit, cycling infrastructure and walkability in areas with multi-family housing, retail and employment will benefit lower-income residents who are less likely to own cars. Some advocates are however concerned that transit investments and rezoning of areas near transit stations and corridors can lead to displacement of existing residents through the conversion of affordable housing and increasing rents as more people want to live on improving boulevards. For this reason, many affordable housing developers and community organizations support density bonuses that allow market rate housing developers to build larger buildings if they include affordable units. Some go a step farther to encourage low baseline allowed densities to increase the incentive for developers to include affordable units. This can be a risky approach since the City could end up with bad land use and few affordable units density bonuses and other land use regulations have only accounted for approximately 2 percent of LA’s stock of affordable housing). I support setting densities along the boulevards high enough to achieve goals of reduced driving and a sufficient concentration of activities and housing to expand walkability – with bonuses for affordability to allow even higher densities. The CASP referenced above has a baseline floor area ratio of 2.5 to 3 along with density bonuses for low income and very low income units, which seems to be a good compromise. Improve walking conditions by enhancing safety and reducing car-oriented land uses. The walkability of a street is based on its perceived safety, usability, and its visual environment. Los Angeles can improve safety by reducing the distance between safe crossings and improving the design of crosswalks. It can also enhance the safety and visual appeal of boulevards by restricting curb cuts, parking lots in front of buildings and car-based land uses such as drive through businesses. The CASP is again a model by limiting these car-based designs that create dangerous and ugly barriers to walkable streets. Eliminate minimum parking requirements. Mandatory minimum parking requirements for commercial and multi-family housing deform buildings, poison the air and climate and decrease affordability and prosperity. Parking requirements for retail and office buildings encourage driving. They banished good urban design like the courtyard apartments that L.A. was known for in the 1920s and 30s and transformed walkable shopping districts with buildings built to the sidewalk into strip malls and isolated buildings behind or above parking. Parking requirements also make buildings more expensive, running up rents for apartments and businesses. Tuck-under parking can add 6 percent to the cost of a medium size 3-4 story apartment while underground parking could increase the rent by 50 percent. Widen sidewalks and increase street trees to allow for ‘grand boulevards’ in Los Angeles. Analysis of some of the streets considered to be among the world’s great boulevards show that walkable and highly-regarded boulevards tend to have very wide sidewalks- sometimes almost as wide as the roadway – and extensive street trees. There may not always be room for substantially expanded sidewalks, bus lanes and bike lanes but a number of the City’s very broad boulevards have space for all three. Build the Backbone network of the City’s bike plan as protected lanes. The City of Los Angeles’ 2010 Bicycle Plan includes 719 miles of painted bikes lanes on major streets. I’ve written before http://la.streetsblog.org/2012/04/17/how-ciclavia-can-inform-implementation-of-the-los-angeles-city-bike-plan/ that this backbone network should be comprised of protected lanes rather than standard painted lanes. There is strong evidence that cities with protected bike infrastructure have significantly higher levels of cycling (and cycling demographics that better reflect the diversity of the population) than cities that lack protected lanes . Up until recently, City agencies resisted planning for protected lanes. However, on-street, protected cycletracks are proposed for LADOT’s My Figueroa! 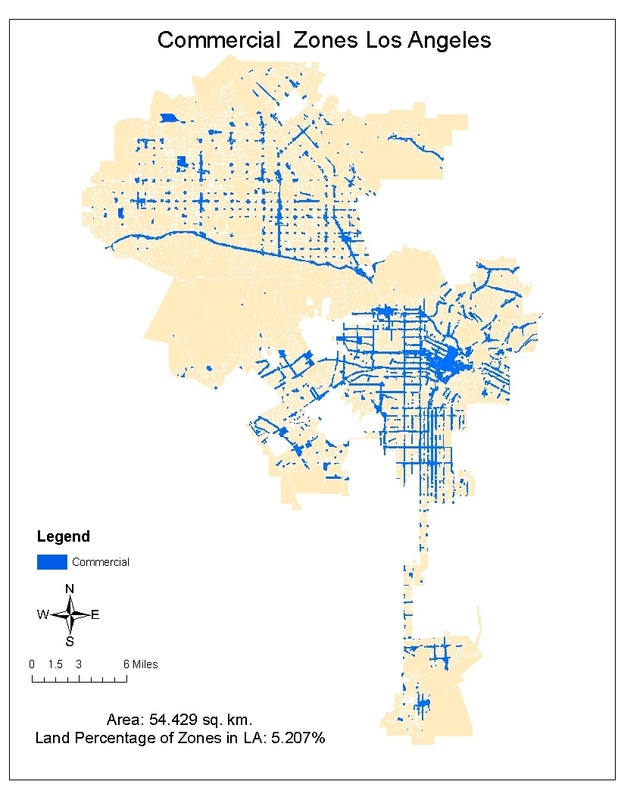 project and the Mobility Element update includes a possible bicycle enhanced network that could consist of protected lanes on some boulevards. The City should seize this opportunity to install a network of world-class protected bike infrastructure on our boulevards to maximize the benefits of cycling for all Angelinos, especially the majority of residents who are not comfortable riding in vehicular traffic. Implementing bike infrastructure as cycletracks at the level of sidewalks. Creating bus bays indented into sidewalks with marked passing areas for bikes at the left edge of a shared bus + bike lane. Placing BRT in the median or center lane with boarding on buses’ left side and rider access to stops via pedestrian bridges (probably the most expensive option). Link building height limits to the width of streets. Building height in Los Angeles is regulated indirectly by floor area ratios and directly by height restrictions, which for multi-family housing and commercial properties, are often guided by height districts . This approach is sometimes disconnected from the context of LA’s boulevards: namely, the width of streets. Allowing a very tall building on a narrow street can create excessive shading and a canyon effect. The opposite problem, common in parts of LA, is to limit height to a couple of stories on very wide boulevards, which makes streets seem desolate and to lack defining edges. Many early zoning codes in places like Paris and New York City set height limits close to the width of the public right of way. Los Angeles might consider replacing many height districts along boulevards with taller limits linked to street width. Legalize sidewalk vending of food. Sidewalk vending of food should be legal in the City of Los Angeles http://streetvendorcampaign.blogspot.com/ to promote entrepreneurship, vibrant public space, and food access in underserved areas. I really think that boulevards is going to be the tough one for LA. If LA can turn its boulevards into places that are pleasant and safe to walk and bike, then it will swiftly evolve into one of the world’s great urban places. All of the other elements are either there already (culture, climate, architectural talent, diversity, street life, historical depth) or soon will be (a comprehensive rail transit network). It will be unstoppable. But boy, is fixing those horrendous, traffic-choked boulevards ever going to be a hard lift politically. All of the major moves that the author rightfully advocates require taking space away from cars, and reallocating it, whether to BRT, widened sidewalks, cycletracks, medians, or what have you. There is going to be absolutely hysterical resistance to every specific proposal to accomplish this, even if there is broad agreement on the wisdom of doing it in general. A lot is riding on the My Figueroa project, because there is no substitute for an on-the-ground, kick-the-tires project where people can see what a Complete Street approach can actually do. But even so, it will be hard — every Complete Street redo will be a fight to the death with car absolutists. Here’s my modest proposal: change CEQA so that there is a complete, categorical exemption for any project that converts public right-of-way currently allocated for automobiles to space reserved for transit or non-motorized transportation. Not streamlined review — total exemption.